I am using the name "Collegiate" here as something of a place holder, lacking a more compelling or universally recognized term. I got the name from a 1930 dance manual (Modern Ballroom Dancing, Ray), and I am using it as a milestone for the state of Youth Dancing around 1930 - the point to which Charleston had evolved by the end of the '20s, and before the Swing craze of the mid '30s, though it's likely that some of people of the time may have used the term "Charleston" to describe what they were doing. It is clearly a point of transition, where some interesting elements are emerging. Complicated step routines: This seems to be the golden age of the complex, practiced step routine. I suspect part of the game, in that youth culture context, was demonstrating your coolness by mastering every new step (many of which involved stomping) as it came along. In terms of styling, executing a complicated step routine could take precedence over the natural flow of the dance. "OK folks, everyone stop what you're doing and do the 'Hoosier Stomp'". Spins and Throw Outs: The signature move of Swing, the woman executing an underarm spin, became a common, standard move. It had not been a frequent element of early Charleston, but become increasingly common through the later '20s. Athleticism: A few kids, the really fit and daring ones, were starting to get really wild. Girls were being flung into the air, or spun around in a circle by an arm and a leg, and boys were doing hand stands. While such extremes were not the norm, they presage the "aerials" of the Swing era. Here are some film clips that give a sense of the state of things at that moment in time in both the white and black communities. If you are looking for a cohesive sense of the dance of the time, it's not there. It's all really a muddled mess, which is what happens at the moment of invention. Here is an excerpt from a 1930 dance manual that describes some Collegiate steps. 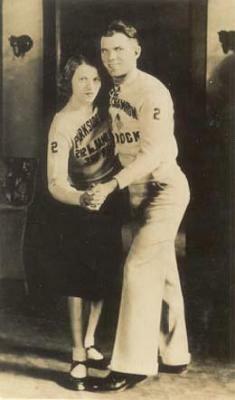 From the 1929 movie "Dance Hall", these clips show some very "Shag-like" moves on a dance floor dominated by Foxtrotters. Note the rapid feet and underarm turns. Meanwhile, in Harlem. This 1929 film features the famous "Shorty George" (called Shorty Stubs here) and other African American dancers showing the state of things at the end of the '20s. Ignore the blackface eccentric dancer at the end. This is also from 1929: "Why be Good". It is a "Charleston Contest" which only goes to show how vague the terminology of the time was. It is, of course, sped up.